Here are five of the best security doors to make your home safer. Home intruders are brazen. At least 34% of them enter through a home’s front door and, once inside, they can burglarize the place in less than ten minutes. By installing a door with added protection, you can upgrade your home’s security to combat this risk, and still have an aesthetically pleasing entryway. A high-security door is often an overlooked feature. Doors are more than a home’s accessory—they are its safeguard. You can find a new security door with excellent curb appeal, or easily upgrade your current door with the right installation skills. We’ve researched various security doors to help you find the best fit for your home. Each featured door is kick-proof and a few withstand severe weather conditions. Here are five of the best security doors to make your home safer. This distressed mahogany door gives a regal appearance to a home. 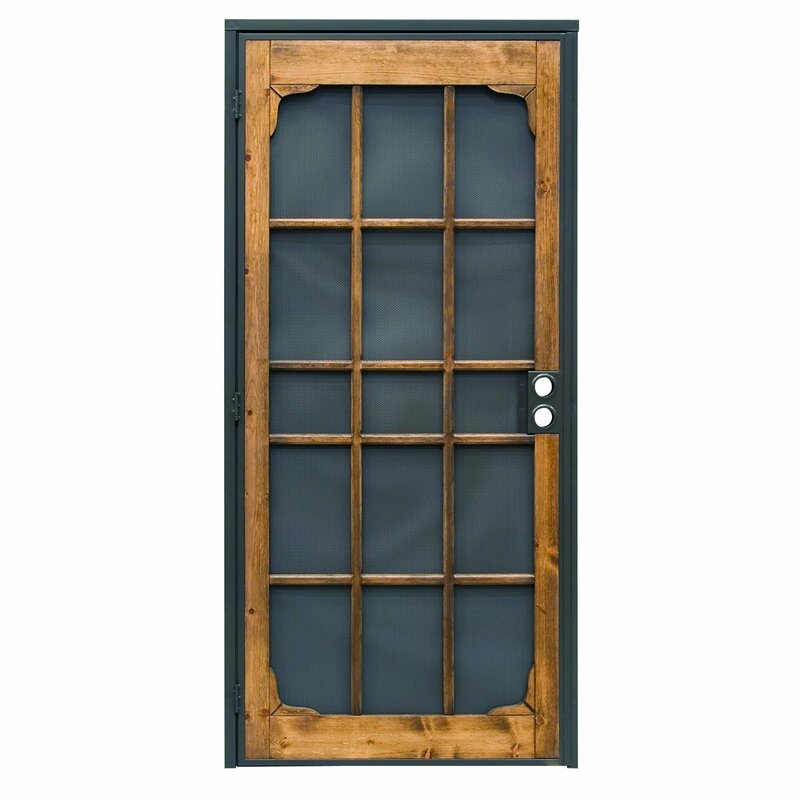 The prehung, two-panel door includes weather stripping, bronze-finished hardware, and a working speakeasy window with a grille. At around $900.00, the 160-pound, nearly two-inch-thick door is solid and does not include veneer paneling. Customers praise this door’s installation and say its high quality is a reason it is relatively easy to set up. The door arrives preassembled with no mouldings. Some customers state that the door is much darker than pictured online and that it makes the door look imposing. 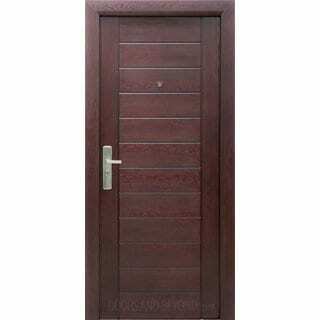 The S100 Exterior Door has a classy, modern look with horizontal paneling and triple coats of red mahogany paint. 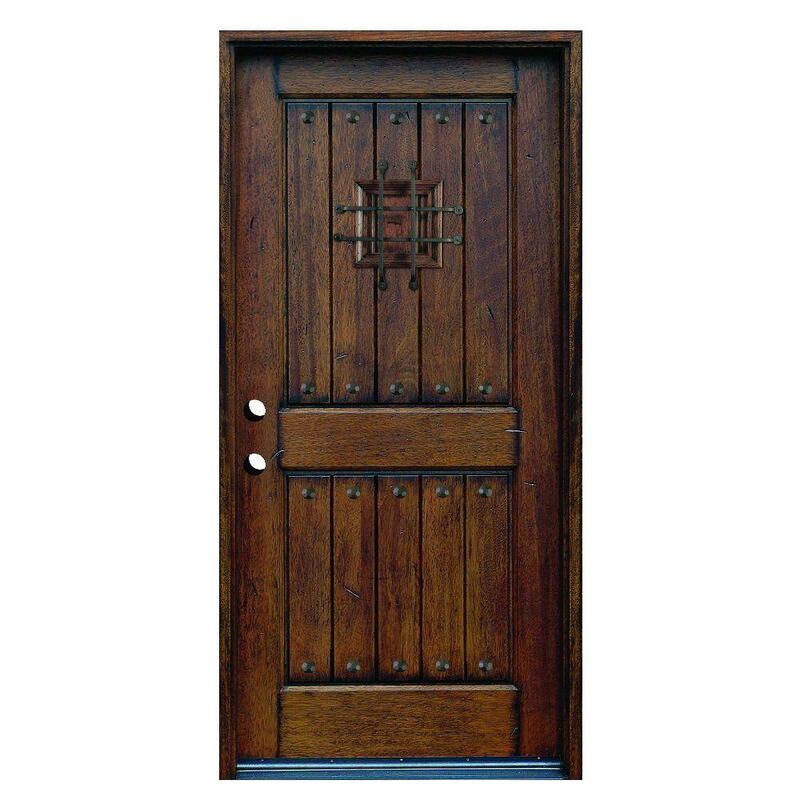 The door has a steel core and wood exterior, adding to its security without taking away any beauty. This door is a little more expensive—close to $3,000.00—but it is made to withstand extreme weather conditions. In addition to the metal plates on the inside, the S100 features four hinges and a multipoint locking system. The S100 Exterior Door comes in one size, and two doors cannot be hung side-by-side to form a double door. 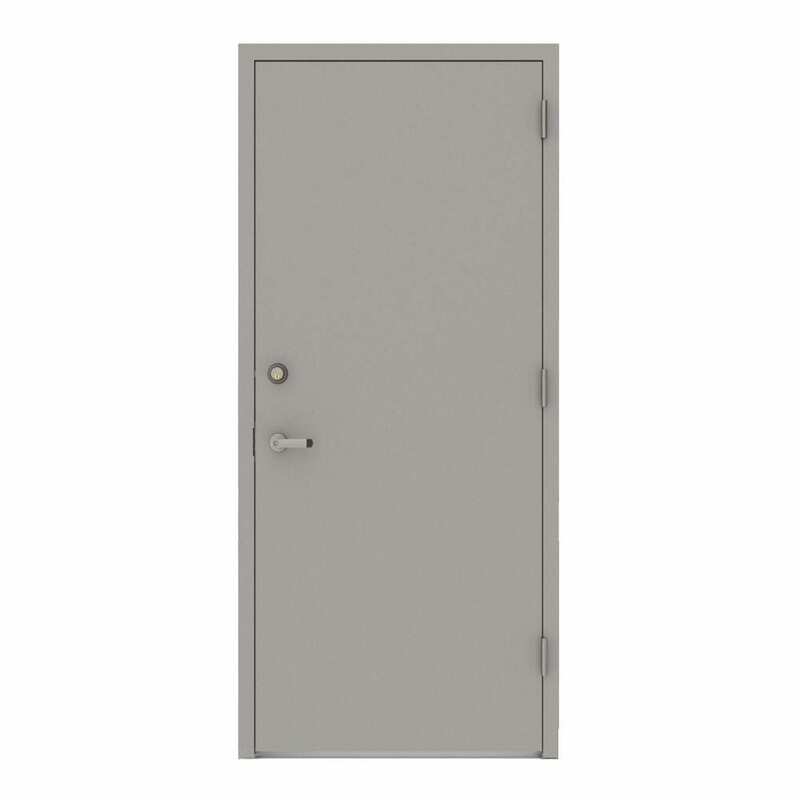 This heavy-duty door is made with galvanneal steel, which is extremely secure and durable. It even helps halt the spread of both fire and smoke. The price is fairly low for a strong steel security door—under $500.00—and it includes the steel frame, too. While the door description says it’s for commercial use, it is also suitable for residential use. Customers praise the high quality, commercial-grade hardware. Though the door is described as gray, it is simply bare metal. The manufacturer explains that the surface is left that way for ease of painting. 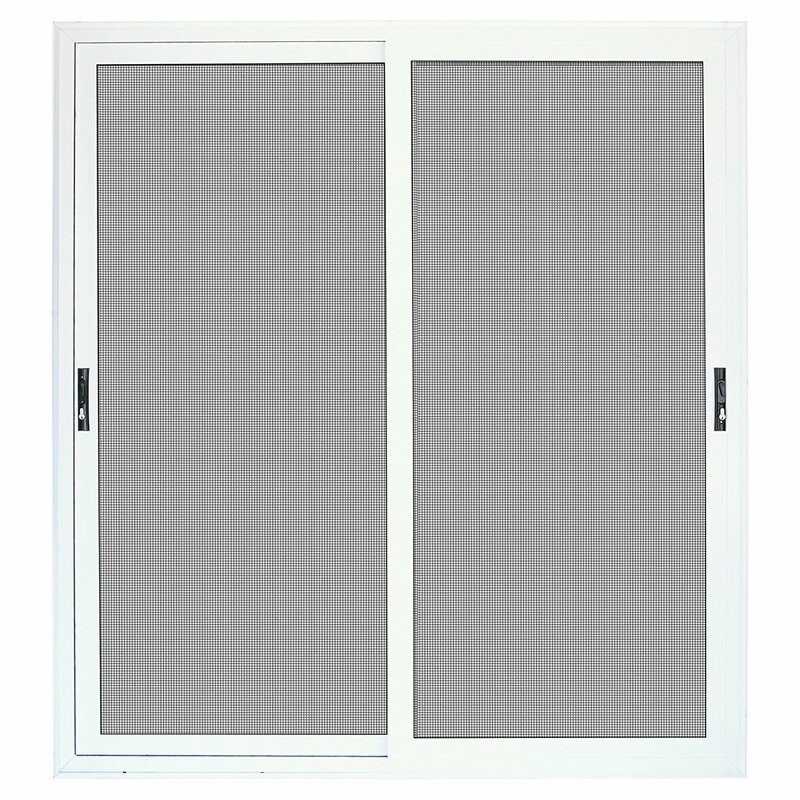 This hinged security screen door has the look of a beautifully framed screen door with the security of an industrial steel door. The frame is steel, the door front is made of 24-gauge perforated steel mesh, and the outer layer is built with thick pine wood. At around $400.00, this is the least expensive door on our list, which is good because you’d need to pair it with a solid door. The steel components are painted bronze, and the pine is stained a light oak color, so the door doesn’t need extra priming or painting before installation. You have to buy your own handle and lock set to use with the Prime-Line Security Door. As a combined screen and security door, the Titan Meshtec uses a stainless steel woven mesh in a patented system that keeps it secure on the frame. At around $2,000.00, the screen will not break if cut or slammed, and its innovative design is ideal to cover fragile sliding glass doors. The Meshtec screen material keeps insects out, blocks harmful UV rays, and does not require bars or panels, so you can enjoy a full view of the outdoors. While the Titan Meshtec uses common screws with a three-point locking system and an aluminum doorframe, customers complain that installation of other similar models can be a headache and that they had to drill additional holes to get the right fit. These key features will make your front door a solid barrier against unwanted criminals. No glass near the door knob. A committed burglar will easily smash a window and open the door from the inside. Solid material. Never have an security exterior door with a hollow core. The strongest door materials are hardwood and steel. Fiberglass is also appealing because of its price, but it can crack with force. Strong dead bolt. A quality dead bolt lock is kick-proof and won’t open with a credit card swipe. Your door’s dead bolt should extend through the doorframe into your home’s framing. Small pet door, if any. Some pet doors are large enough for a human to squeeze right through. If you need a large doggy door for your pet, secure it. First, you need to know whether your high-security door is a prehung or slab door. Prehung doors come with the doorframe, while slab doors just include the door. Prehung doors are a necessity if your current door is more than twenty-five years old because they ensure a sealed frame. Second, you may want to hire a professional installer. You need a lot of precision to make sure your door snaps into its latch and swings effortlessly on its hinges. If you choose to install a prehung door yourself, follow step-by-step instructions. Third, whether you are installing a security door yourself or hiring a professional, make sure your dead bolt and lockset are reinforced. The dead bolt should be a Grade 1 quality deadbolt and have a latch—or throw bolt—that is at least one inch long. The strike plate should require four screws that extend into the wall frame. Give a great first impression to your home visitors, and a big warning sign to potential home intruders, with one of these high-security front doors. You can quickly and easily upgrade your homewhen you add a door with extra security features. For additional ways to secure your front door, check out our post on door jammers!